often this next two sets will definitely come in handy! The card I used is from SVGCuts Summer Blockbuster svg kit and I decorate it with both new sets. The popcorn background also comes with dies to cut the popcorn out, so I cut them out and glue them to the top inside of the card. All the elements on the card front is from the Date Night set including the sentiment. 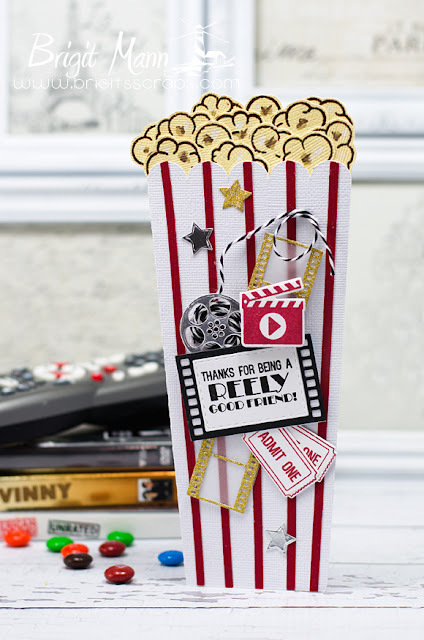 I had so much fun putting this card together, just pop in a gift card and you have a nice gift for a movie lover friend!